I wrote last week about how much I enjoying cycling now that I am uploading my data to Strava. The ability to compare segments has made the rides much more enjoyable. 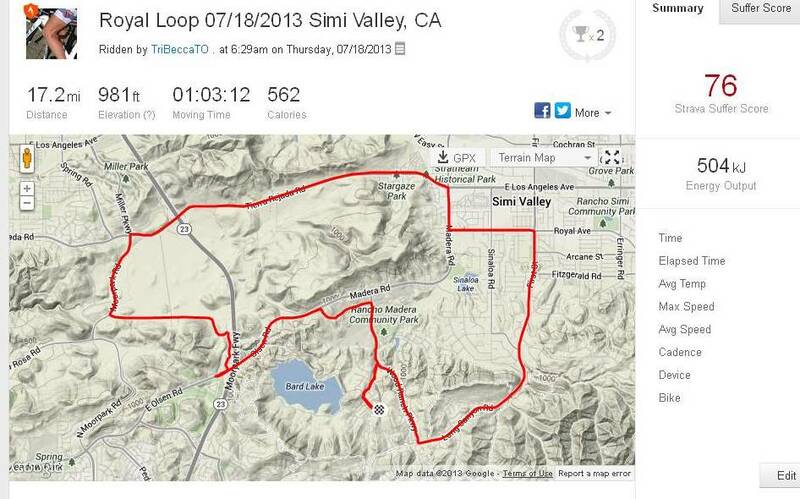 So this morning I went out for the ride we call the Royal Loop. I have become familiar with where many of the segments are on this loop and I am always trying to better myself. Since I can’t ride every segment better every time I ride the loop I decided to work on one in particular. It is a straight 1 mile piece on a slightly busy road. I hammered it (as best I can) and then came home to check the data. I got QOM!!! The fastest woman to ride that segment so far. I beat him as well! I am sure he will try to beat my time soon. He even said he was gonna go ride the loop tonight. Regardless, I am loving the bike and happy as can be! Oh he did did he! Well, I still beat Stuart! He probably was but I have a crazy high HR compared to most.